Roughly one out of one hundred people are affected by celiac disease and many more are eliminating gluten from their diets for health reasons. It is suspected that many individuals on a gluten-free diet are still frequently exposed to gluten, as evidenced by the 50% of celiac patients who continue to experience symptoms as well as elevated autoantibodies and/or damage to the villi of the small intestine. The exact cause or causes of exposure may be hard to pinpoint, but most likely includes a combination of inadequate education on gluten-containing foods, cross-contamination (particularly in restaurants), and lack of compliance due to the nearly-ubiquitous presence of gluten in the food supply along with social pressure. Although these advancements regarding commercially available gluten enzyme(s) supplements are exciting for individuals who experience adverse reactions to gluten, it is still recommended that those who need to follow a gluten-free diet continue to do so to the best of their ability. As little as 10-100 mg of gluten can cause a problem for those with celiac disease, which is about the amount of exposure from cross-contamination or hidden sources of gluten in processed foods.4 Oral AN-PEP containing supplements are not a substitute for a gluten-free diet and are not intended to allow voluntary deviation from the recommended diet. However, endo- and exopeptidases may mitigate the damaging effects of accidental gluten exposure. Ianiro, G, et al. Digestive Enzyme Supplementation in Gastrointestinal Disease. Curr Drug Metab. 2016 Feb; 17(2):187-93. Sadlen, BN et al. Randomised clinical study: Aspergillus niger-derived enzyme digests gluten in the stomach of healthy volunters. Aliment Pharmacol Ther. 2015 Aug; 42(3): 273-85. Ehren, J, et al. 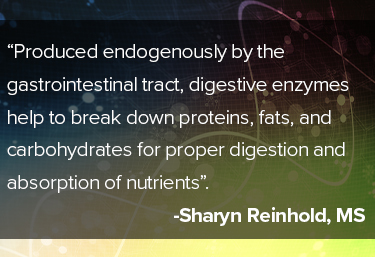 A Food-Grade Enzyme Preparation with Modest Gluten Detoxification Properties. PLoS One. 2009; 4(7): e6313. Tack, GJ, et al. Consumption of gluten with gluten-degrading enzyme by celiac patients: A pilot study. World J Gastroenterol. Sept. 2013; 19(35): 5837-47.